The marinade is a simple blend of soy sauce and garlic, along seasonings, and the sauce is made with apricot preserves. Peach preserves may be used in the recipe as well. The sauce complements the pork roast beautifully. Serve this pork loin roast with rice or a noodle dish for a fabulous family meal. In a large food storage bag or glass bowl, combine 1/2 cup chicken broth, the soy sauce, minced garlic, dry mustard, thyme, and ginger. Add pork roast, turning to coat well. Cover and refrigerate for 4 hours, turning occasionally. Remove pork roast and discard the marinade. Place pork roast, fat side up, on a rack in a foil-lined roasting pan. Bake in the preheated oven, uncovered, for 1 1/2 to 2 hours, or until a meat thermometer or instant-read food thermometer registers at least 145 F when inserted into the center of the roast. Remove the roast from the oven, tent loosely with a sheet of foil, and let it stand for 15 minutes before slicing. Meanwhile, in a saucepan over medium heat, combine the preserves, 2 tablespoons of chicken broth or sherry, and 1 tablespoon of soy sauce. Bring the sauce to a boil and turn the heat to low. Simmer for 1 minute. 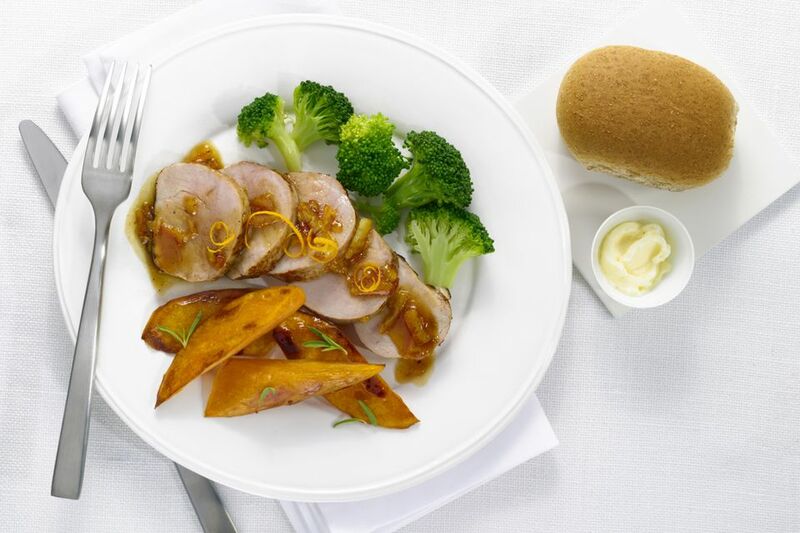 Slice the pork loin thinly and serve it with the apricot sauce. Use a dry white wine or vermouth in the apricot sauce if you don't have dry sherry. For a spicier sauce, add 1 teaspoon of Asian chili garlic paste (sambal) to the apricot sauce. Leftover Pork? Use it to make this pork and spaghetti casserole or this pork and mashed potato casserole, a tasty take on a shepherd's pie. Sliced pork makes great sandwiches, too. Serve it in open-faced sandwiches with purchased pork gravy. If you are roasting a bone-in pork loin, make sure the thermometer does not touch bone when you check the temperature. Boneless pork loin generally takes about 20 to 25 minutes per pound, but a bone-in pork roast can take 30 to 40 minutes per pound.